Dragon's Awakening by Sean Fletcher is the first book in the Heir of Dragons series. Kaylee Richards was just an ordinary girl going on a normal first date before her first day of high school. Things take a turn for the worse when not only does her date turn out to be a creep, but he attempts to kill her with a sword and claims that she's a dragon-kin. The sword is not as shocking as the sudden storm that appears out of nowhere and how she manages to set a barn on fire. After her best friend saves her, she discovers that not only is she a half dragon/half human called a dragon-kin, but she also has the ability to conjure up a storm and is being hunted by a dragon hating group of hunters called Slayers. When Kaylee discovers that the Slayers have something planned and she somehow plays a role, she teams up with her best friend, an overly dedicated wizard, and his protector to stop the Slayers before it's too late. Kaylee has a normal life and is excited about a first date when she's thrown into this whole other world where she's a storm-conjuring dragon. It feels more like a start to a coming of age story as she finds her place in this new life and has to learn how to control her new abilities. To help her find a place, she turns to her best friend, Jade, and two new friends, Edwin and his protector Maddox. Sean Fletcher creates an intriguing world of dragons and magic, with characters that are likable and charming. Kaylee and her friends form a little unit, where they may argue and clash, but they also need each other, drive each other for the better, and keep each other grounded. They have magic and ninja-like fighting skills, but they're still teenagers and they've connected in their desire to prove themselves. They're all capable of doing extraordinary things, but no one trusts them to really do anything. 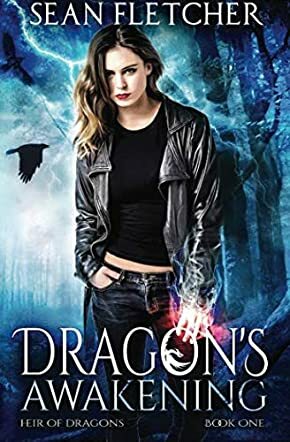 Kaylee wants to prove to herself that she can harness this new power, while Jade wants to prove that she can do something else in her life, away from this society of dragons and magic. Edwin is largely ignored by his dad, and is stuck in his head trying to learn as much magic as possible. Maddox is kind of kept in the background, coming across as being very light in personality and laid back, but he's still an active part of everything that's happening. Dragon's Awakening is a fantastic start to a series, a light read with humor, danger, friendship, and a coming age adventure that's addictive and fun.